Jaylen Brown, inserted into the starting lineup on Sunday, was able to frustrate Indiana's Bojan Bogdanovic. 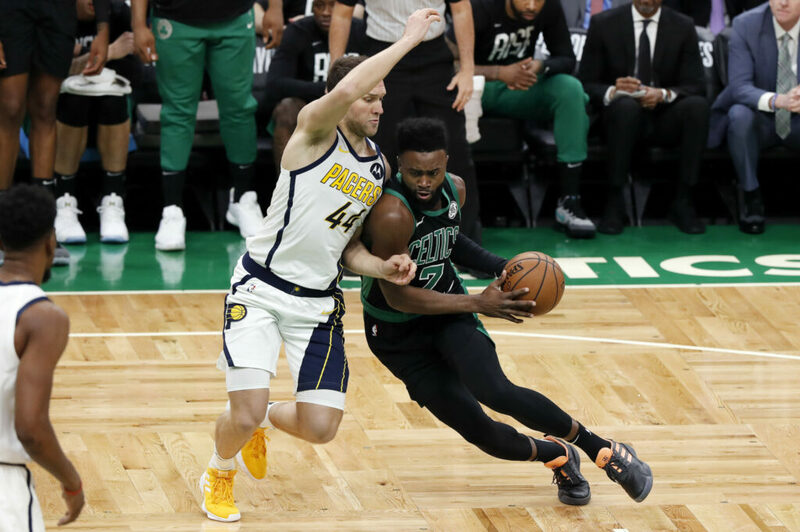 BOSTON — With Marcus Smart sidelined by injury, Jaylen Brown was inserted into the Celtics’ starting lineup Sunday in Boston’s 84-74 win over Indiana in Game 1 of their first-round playoff series. Brown started 25 games this season, most of them before the end of November. On Sunday, he made only 1 of 5 shots, missing three 3-pointers, and had five rebounds. While Brown did little at the offensive end, he played a key role on defense, helping to limit Bojan Bogdanovic, who scored only 12 points on 4-for-11 shooting with no 3-pointers. GORDON HAYWARD, who missed all of last season because of injury, saw his first playoff action Sunday since May 2017. Hayward continued his role as primary playmaker on the second unit with a 10-point, four-assist, seven-rebound performance. Like his teammates, the Celtics’ forward got off to a slow start. ARON BAYNES howled in pain during a second-half collision with Thaddeus Young that sent the Celtics’ center momentarily to the bench. But after the training staff attended to his left leg, Baynes returned to the floor. It was nothing, he said. CAVALIERS: Cleveland has scheduled meetings this week with Dallas assistant Jamahl Mosley and Miami’s Juwan Howard for the job, a person familiar with the team’s plans told The Associated Press. The interviews are the only ones finalized so far, said the person who spoke on condition of anonymity because the team is not publicly commenting during its search to hire Cleveland’s fifth coach since 2013. JOHN MACLEOD, the longtime NBA coach who led the Phoenix Suns to the 1976 NBA Finals, has died. He was 81. MacLeod’s son, Matt, confirmed his father’s death to The Associated Press. The elder MacLeod fought Alzheimer’s disease for more than a decade. MacLeod is the winningest coach in Suns history, going 579-543 in the regular season from 1973-87. He also coached the Dallas Mavericks from 1987-89 and the New York Knicks in 1990-91. 76ERS 145, NETS 123: Ben Simmons had 18 points, 12 assists and 10 rebounds and Philadelphia had an answer for pesky Brooklyn in a win to even their Eastern Conference playoff series, in Philadelphia. Simmons had a disastrous Game 1, on the court (nine points) and from a PR perspective after he criticized fans for booing during a game the Sixers were never really in. He backtracked the next day at practice and never gave another 20,591 fans a chance to do anything but roar in approval in Game 2. Simmons flashed the All-Star form that helped lead the Sixers to 51 wins, and was aggressive from tipoff. He used his size and speed to attack the lane and scored 16 points in the half – and then put the game away in the third.